This is the second post for Foodies Read 2016. Here's the first post on the book Vertical by Rex Pickett, author of Sideways. And yes we have a delicious menu at the end; with mushrooms, goat cheese and figs. But not necessarily combined. Foodies, you'll just have to read on! is a little weird, utterly fantastic, and surely wild and delightful. But it's more than a tale about some odd but intelligent guy, Cosimo, who goes off to spend his life hunting in, sowing crops from, and traversing carob, fig, pear, and plum trees in Ombrasa, Italy; its really more about living close to nature, and enlightenment in the age of a philosophic contemporary, Rosseau. Let's see, where have we heard that theme lately? Where? I think it's a perfect story for today, and applies whole-heartedly as we entertain wildness and foraging, even like Cosimo did, at the highest levels, no pun intended; such as when Conde Naste Traveler wrote about the world's top hotel's who offer guests, the option to pay big bucks, to forage for a few ingredients for their dinners. In today's world we also wait for tables months in advance at places like Noma where we gladly dine on "green shoots of the season with scallop marinade." Dishes that might be called scavenging if we were left to our own devices! And so, food runs throughout, and plays a role in Cosimo's journey which begins at lunch one day in early summer. "It was the fifteenth of June 1767, that Cosimo Piovasco di Rondo, my brother, sat among us for the very last time. And it might have been today, I remember it so clearly. We were in the dining room of our house in Ombrosa, the windows framing the thick branches of the great holm oak in the park. It was midday, the traditional dinner hour followed by our family, though by then most nobles had taken to the fashion set by the sluggard Court of France of dining halfway through the afternoon. A breeze was blowing from the sea, I remember rustling the leaves. Cosimo said, 'I told you I didn't want any, and I don't!' and pushed away his plateful of snails. Never had we seen such disobedience." Cosimo is definitely a character! I love this guy. He's a hero and a strong-willed young Italian nobleman in the 18th Century and perhaps like many Italian nobleman even in the 21st century, he rebels against parental authority, and against society. It may seem unlikely that he can pull it off but after his snail refusal he climbs into the trees and stays there for the rest of his life. Part of the reason he's there is his sister. Purported to be a gifted, if not slightly sadistic, culinarian is Cosimo's sister, Battista. "She made pate toast of rat liver, grasshopper claws laid out on a tart crust, porcupine cooked until rosy and tender, Or she worked jewelry out of the cauliflower and hares ears, pigs ears, and lobster tongues." What, that's not exactly yummy? 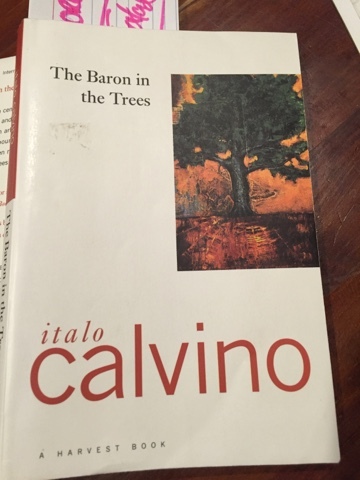 "On a fig tree, though, as long as he saw to it that a branch could bear his weight, he could move about forever; Cosimo would stand under the pavilion of leaves, watching the sun appear through the network of twigs and branches, the gradual swell of the green fruit, smelling the scent of flowers budding in the stalks. The fig tree seemed to absorb him, permeate him with its gummy texture and the buzz of hornets; after a little Cosimo would begin to feel he was becoming a fig tree himself, and move away, uneasy." But how did Cosimo survive in the trees; did he only eat fruit and nuts; Euell Gibboning his way to heaven? "In fact he did everything in the trees. He had found a way to roast the game he caught on spit; without ever coming down. This is what he did; he would light a pine cone with a flint and throw it to the ground on a spot already arranged for fire (I had set this up, with some smooth stones); then he would drop twigs and dried branches on it regulating the flame with a poker tied on a long stick in such a way that it reached the spit, which was hanging from two branches. All this called for great care, as it is easy to start a fire in the trees." And is it not perfectly preferable to quaff one's thirst with a bit of goat milk? And have fresh laid eggs? Of course, Cosimo knows the answer. It is. "He made friends with a goat, which would climb up the fork of an olive tree a foot or two from the ground; but it did not really climb up, it just put its two rear hoofs up, so that he could come down into the fork with a pail and milk it." "He had made a similar arrangement with a chicken, a red Paduan, a very good layer. He had made a secret nest in the hole of a trunk, and on alternate days he would find an egg, which he drank after making two holes in it with a pin." As Cosimo ages, he climbs higher and higher in the trees, until one day, barely still alive, he grabs hold of a balloon's anchor rope and escapes into the sky! And that's the last we see of him. What he's left us with, or me anyway, is the wonder of life. Cosimo, here's a dinner I created with you in mind. made in one pot, this soup is a wonderful way to warm up to the meal and impending conversations. both while making it in the kitchen and eating it at the table. Heat the oil in a heavy bottomed soup kettle over medium heat. add the garlic, onions, carrots, celery, peppers, and fresh mushrooms. Saute these, stirring and tossing, for 7-8 minutes, or until softened. pour in the white wine and scrape up any browned bits of vegetables. Add the dried mushrooms, their liquid and stock or water and bring to a boil. Simmer for 40-50 minutes. stir in the cream. in a separate bowl beat the three eggs and add to the simmering soup, continue to heat over medium for a minute or two, till the eggs cook. remove from heat, transfer to a tureen or serve right from the stove. Top each bowl with some of the grated cheese and the fresh chopped parsley. This is a perfect dish because it can be so very flexible. And ready quickly. Like spring? Warm one dang minute, and icy the next. Love spinach? No problem. Kale? Swiss Chard? Cheese, too? Put it all in there. The finished frittata is pretty, but rustic, and ready for your fork. Serve warm or cold. Break the eggs in a bowl and add salt and pepper, using a whisk or a simple kitchen fork and mix well with the fresh herbs. Prepare the greens as per chef’s instructions. Heat a large heavy skillet such as a cast iron pan, over medium, till hot. Add olive oil and when hot add green garlic, sauté for one minute, and then add the greens. Sauté till just bright green. Add egg mixture to very hot pan. Using a fork stir the eggs in a circular motion towards the center, eggs will cook very quickly. Push down any ingredients with a fork, and reduce heat. Cover with a lid, keeping heat on medium. When completely cooked, add the cheese, and slide off onto a pretty round plate. Serve warm and garnish with a few chopped herbs and, a fork. In a large bowl, combine flour, baking powder, sugar, cinnamon, salt, walnuts and figs. stir until blended. Add the melted butter. then the 2 eggs and vanilla. Stir with a wooden spoon. turn out dough onto a lightly floured surface. knead until dough is blended. Divide dough in half. roll into two loaves, about 12 inches long. place the loaves on a parchment-lined cookie sheet, spacing them 3 inches apart. In a small bowl, beat remaining egg with a fork. using a pastry brush, brush the beaten egg on top of the fig and walnut loaves. Remove from the oven. Carefully remove hot fig and walnut loaves from the cookie sheet and place on a cutting board. while warm, slice the loaves diagonally into ½-inch-wide slices. Place slices in a single layer on the cookie sheet. return to oven for 15 to 20 minutes, or until lightly browned. remove cookies sheet from the oven. cool fig and walnut toasted biscotti on wire cooling rack. store in an airtight container. This sounds like a wonderful book. I'd like to live in a tree but with a super-fancy tree house of course. Your recipes are a perfect fit. Thanks for linking up to Foodies Read. Ha! You and me both! And there are some pretty amazing treehouses out there for sure, too. Now how to make the biscotti in a tree? Thanks for being here, Heather! Great post Dorette. Sounds interesting and I love the recipes you shared. Look forward to reading this and trying your recipes!